The Shidas stick to the policy of organic chemical-free roses for more than 16 years since they noticed how harmful agrichemicals are. 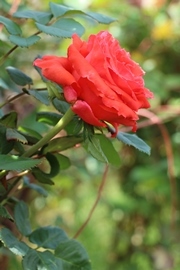 They pursue the rose-friendly cultivation methods by watering clean water and using natural microbes and bacillus subtilis natto (type of fungus from Japanese traditional sticky natto) for pest control. They grow roses with a sense of gratitude which they believe it will echo through roses’ heart. “Rose petals grow in a whirl, just like the Galaxy does. I believe that roses symbolize the outer space. I can’t stop thinking I was born to grow roses!” he speaks, with a big happy smile on his face. “Pasadena” is used for dyeing items. This species is popular for their long-life beauty.